Is it the heat or was that mountain talking to me? A lot can be said about the Spanish heat and when one lives in Andalucía, people never seem to tire of the subject. Just as they stop bemoaning ‘que frío’ (What a cold!) far into our balmy spring, they start whining about ‘que calor!’ (What heat! ), until they re-start complaining about the cold again in the fall. 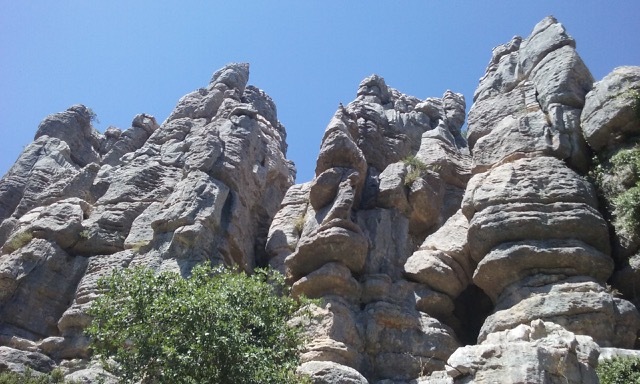 The other day my husband and I decided to visit the famous El Torcal near the town of Antequera in Malaga province. 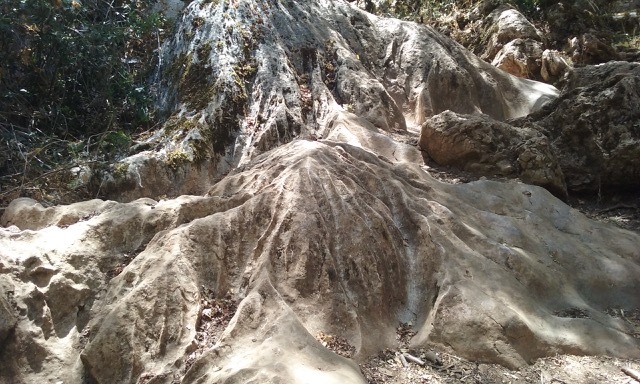 We had seen pictures of the hoodoo-like landscape and were keen to explore it ourselves. 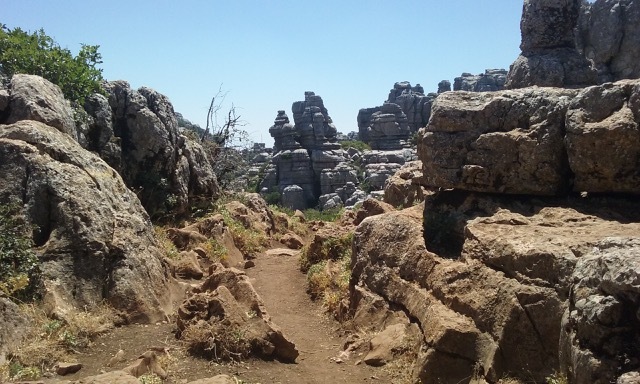 Driving into Antequera, El Torcal is located 12 km up a winding road, ending at an otherworldly plateau at about 1100 meters. Arriving during siesta hour when no Spaniards wish to be stirring, we decided to start with lunch at the café, while overlooking the amazing landscape. 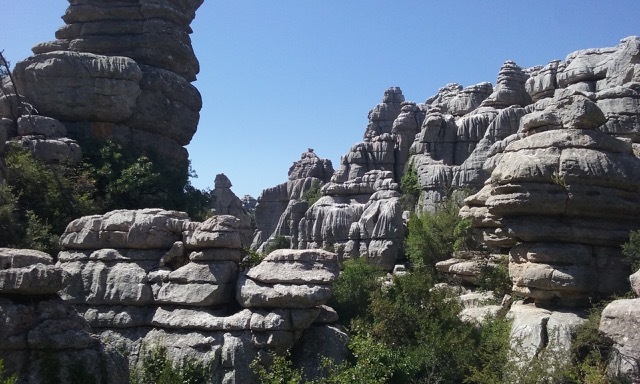 El Torcal Nature Reserve is said to be one of the most impressive limestone landscapes in all of Europe. The Jurassic age stone, some 150 million years old, spent its first millennia under water. Movements of the earth trusted the sea beds into mountains, which then rain and wind eroded and chiseled away at for further millions of years, forming some most incredible shapes. Not being ones to back away from challenges, we left a few visiting families with cokes and ice creams and sat out in the 40-plus-degree heat to explore this enchanted landscape, bellies full and water bottles in hand. 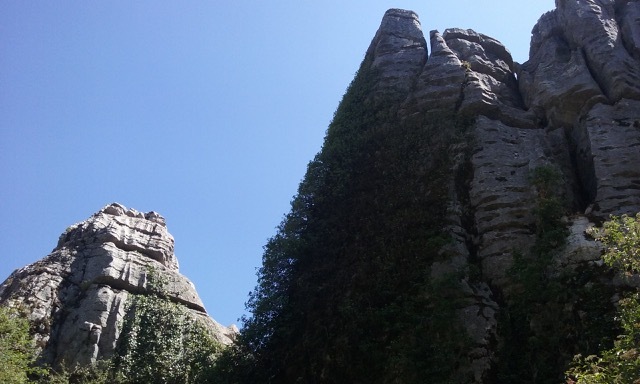 The Torcal trails are frequently sign posted and well made and meander harmoniously through valley after valley of sculpted rocks. Not surprisingly in this heat we only saw two other individuals on our walk, though they might of course have been a mirage? As one spends most of ones time staring UP in utter disbelief and jaw-dropping amazement at the troll-faced rocky outcrops while handing oneself blindly along and only intermittently peaking down to catch ones bearings, one cannot avoid but getting completely lost in time and space. They say that the furthest walk, which is only about 4,5 km long, takes 3 hours, though we must have spent an eternity. Time becomes a daze. The upwards gaze also is conducive to taking a wrong path and coming to one of many dead ends, so after being lost at least twice in spite of said signage, we ran into one of the resident wild goats with her offspring. They were clearly used to human explorers, staring at us with an ‘I wasn’t expecting you people until after the siesta’ look. Like being in Monument Valley, possibly on acid, we started feeling that peering eyes from above observed us. Haughty eagle heads topped cliffs and flat nosed gangsters seemed to holler across the valley to yet another shady rock figure. We even passed a whole jury, all clad in stone. It would take the most cynic of minds not to see mythical beings with giant noses coming out of these rocks. Some have actually been given official names, such as the Sphinx, the Jug and the famous Camel. The further on one ventures, and possibly the hotter it gets, the more the mountains come alive. They say that the best things in life are free, and that is certainly true of El Torcal. If our visit was at high noon, I can just imagine how fantastically eerie it must be to explore these rocks alone on a foggy November eve.